Spend the day on your own in New York City! Spend the day on your own exploring all that New York City has to offer. Here a few ideas to get you started! 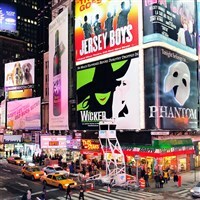 Please contact our office for more information regarding pricing and availability for all Broadway Shows. Drop off at 51st Street between 7th & 8th Avenues - Bus will drop off as close to this location as possible if there is construction in the area. Bus will Depart NYC at 6:00pm from the same location that you were dropped off. - Please check with your tour director for more information regarding this location before disembarking for the day.